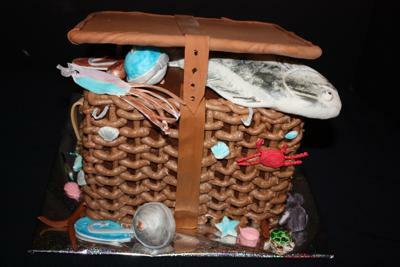 This cake for a fisherman is 3 layers of square cake and covered with chocolate butter cream. I used tip #10 for the basketwork. The fish is made from gum paste. I let it dry for four days and I used silver powder and black and grey food color for the final details. The crab, stars and shells are made from royal icing. The hooks and other decorations are made from from fondant and I used silver,gold and blue powder to apply the final touches. The lid is cardboard, covered with fondant. That is very cool! My hubby would like that too. The fish is really cool...did you take pix of it alone? If you did, please send them to my email. Join in and write your own page! It's easy to do. How? Simply click here to return to Fishing Theme Cake.